I truly try and let the yarn guide my project. I want to love what I work on and I want the yarn that I am using to be the star of the project. This project has some history. 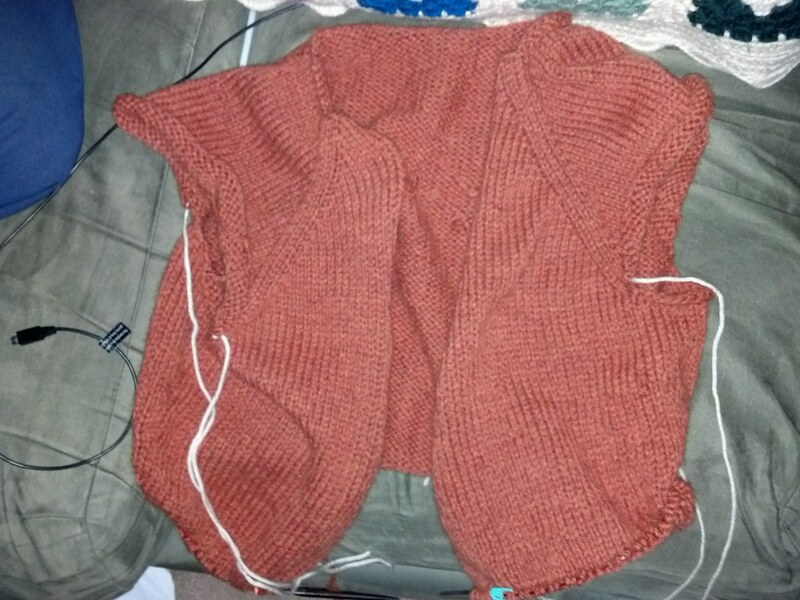 It started it's life as a vest that I just wasn't pleased with and ended as a cardigan. In the middle however, I decided to make it a different size and ripped it apart again. Back in October, I decided I wanted to finish my half done sweater but when I looked at it I realized that I was making it too big. I had just started my journey to weight loss surgery and knew that even if I finished before the surgery, I wouldn't be able to wear it for long. So I started over and was shocked at how fast this project went. I began with a new skein of yarn and once that was used I ripped out the needles on the old sweater and started to use the yarn that was already knitted. I was about 4 skeins into the sweater and I didn't want to rip it out and re ball it. So I am carried around 2 sweaters, one that is growing and one that is shrinking. I was shocked that in 6 short weeks I was able to finish the sweater. 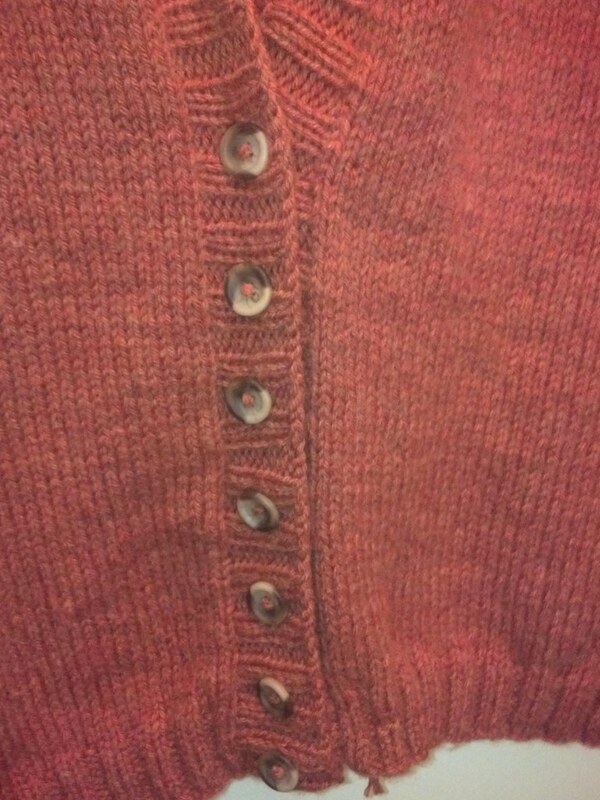 I had the entire thing done and the buttons on but still had ends to weave in. It was also about the time that I was prepping for surgery so I hung it up in my closet and left it alone for a bit. 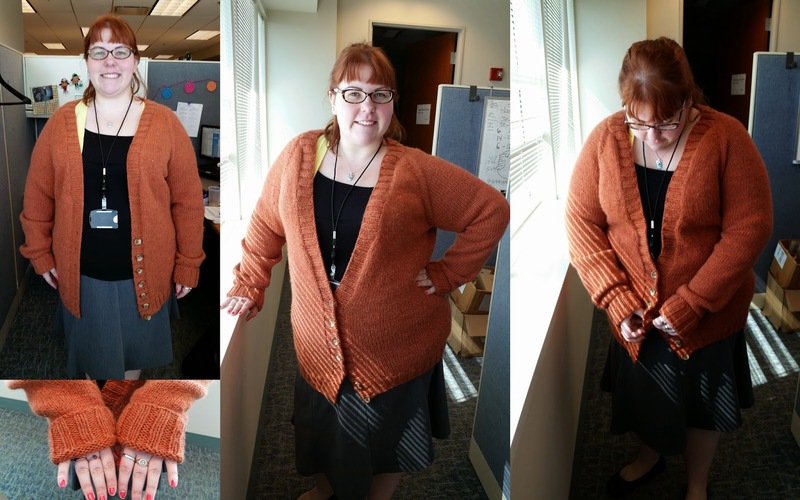 Then earlier this month I stared at my almost finished sweater and decided it was time. Between loads of laundry I sat on my bed and worked through weaving all the ends. It was done and time for it's photo shoot. Check out more Finished Objects at Tami's Amis!